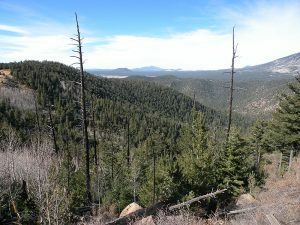 Agencies Involved: USFS Coconino National Forest, City of Flagstaff, and the Arizona Department of Forestry and Fire Management. Vegetation and steep slopes in the Dry Lake Hills/Mt. Elden area. The 2010 Schultz Fire demonstrated the potential impacts of severe fire and flooding near the community. The Forest Service, City, and State are working together to reduce the risk of severe fire and flooding in the Rio de Flag and Lake Mary watersheds. Flagstaff voters passed the $10 million bond with approximately 74% approval. The bond is support fuels planning and treatment efforts in crucial watersheds in Observatory Mesa, the Dry Lake Hills, and Mormon Mountain areas. Treatments could include traditional logging, hand thinning, prescribed fire, helicopter logging and cable logging. Public involvement is a key element in this endeavor. We encourage the public to be actively engaged throughout the process.